We went there 12noon Bank Hol' Monday 7th May 2012. Intended to eat, so set up a tab & ordered a pint of Badger Firkin Fox & a lager for 'the missus'. The Badger was bitter as hell & I could not drink it ( I have brewed beer for years & know whats what). Substituted with a pint of Tanglefoot, went to table & it was 'minging', like full of water, even my wife said the same (YES she likes ale too). Took both back to the bar & refused to pay, saying the beer was sub-standard & the staff appeared not bothered. Wondering if somebody did not flush the pipes after cleaning??? Oh dear. Couldn't get through by phone to book, so booked online. Got confirmation email of this. Got there, no sign of reservation. No-one had bothered to check the computer. I'd asked in writing for a quiet corner...so we were put next to the coffee grinder in the busiest bit of the restaurant. My friend's fish and chips was bad enough that she left much of it "The chips were either so overdone you couldn't bite into them, or very underdone - strange!" My salad was the oddest I've had. : Everything was chopped into tiny pieces barring the egg and the tomato, and so I had quarter inch of chopped ingredients with those items perched on top. Hardly any avocado. The 'hand torn chicken' was cubed and processed. No dressing, nor offer of one. Staff were nice, which was something. I've eaten here before and it was ok, but this was beyond strange. I don't know why this pub has received any bad reviews, I have been there several times lately, the service & food is always great, the staff are freindly & the beer is very good. I can only think that the people that have been there and have given bad reviews are snobs & toffee nosed gits, who would be more at home in the Hilton hotel restaurant or similar. By the way I have been to the Hilton hotel restaurant, the service was appalling, the food was terrible & the cost was �160 for 4 of us, never, never, never, again, so snobs go fourth & get ripped off! 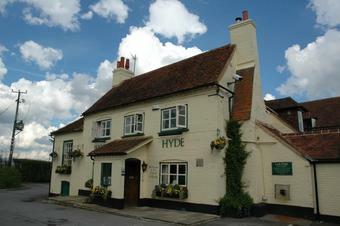 Went to the J & H on 28 August for Sunday lunch, 4 people. Huge portions, but poor quality. The veg & pots were good but the Yorkshire Pudding was rubbery. My beef was tasteless & another's turkey was bland. My wife chose a chicken meal that she really did not eat much of, tasteless! All-in-all a pretty poor experience. I live not too far away from the J & H but will not be using it again for food as there are better places nearby. After having the opportunity to utilise the Jekyll and Hyde again the other week for the first time in some 15 years I can see where Nofanofbritain is coming from, as it has certainly changed from the rural country pub I used to frequent. However, as Darwin correctly stated, it is not the strongest who survive but those that are able to change and evolve in response to the changing environment around them. And in that respect I thought the Jekyll and Hyde has done this quite well. Probably a lot better than Nofanofbritain who has disappeared since 2008 after posting several disparaging comments about anywhere that dared to move away from what he wanted. As a large roadside pub, basically in the middle of nowhere between two largish population centres, it has to try and provide something that will entice people to get in their cars and drive out to, so it�s no great surprise that it focuses on food and has been given a modern makeover that provides a clean comfortable environment, mainly for dining. But in my opinion they have avoided the trap of making it completely a gastro restaurant and there is enough of a pub feel still about it, especially the front two areas which are more aligned to just sitting and drinking. And a lot of the original features, the large stone fireplaces, most of the oak beams e.t.c. have been retained. And the beer is good, very good in fact, but then I do like Hall and Woodhouse beers. There are four pumps lined up on the bar, two dispensing Badger and Tanglefoot and then the other two dispensing the seasonal brew. At the moment that is Fursty Ferret, which I thought was a bit thin and lacking in taste for 4.4% ale, but fortunately the Badger and Tanglefoot were on good form.